Before the development of digital resources, business cards were practically the only way to share business information with another person. Today, there are countless digital resources used to share business information and stay connected to individuals and companies. The emergence of smartphones made sharing information instantaneous at the point of contact nullifying the need to carry and exchange cards. There is no arguing that staying organized and connected is easier with digital tools like content management systems, marketing automation software, email marketing platforms and social media. As these digital resources are becoming an industry standard in the business world, it raises the question: are business cards still relevant to staying connected? 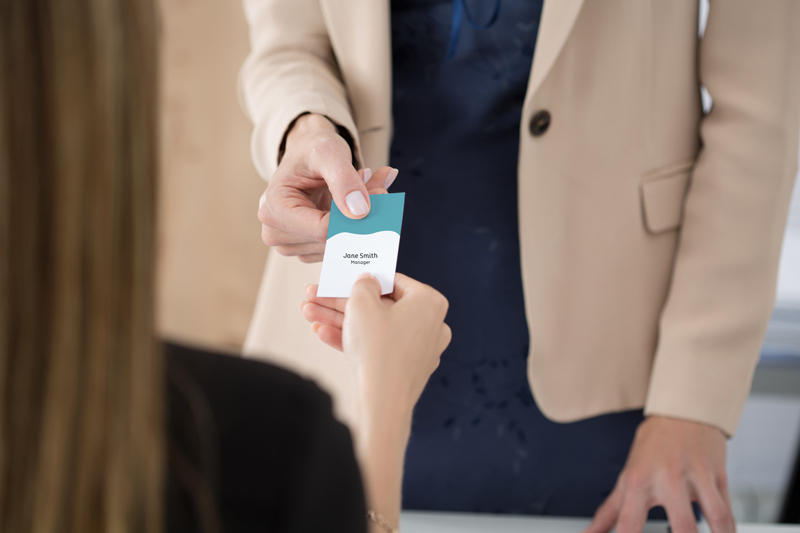 While digital media platforms have made networking much easier, a well-crafted business card can be a powerful tool in person-to-person marketing and networking. Business cards are still the fastest, most accurate way to exchange information and the physical interaction of exchanging them adds significant value when establishing a connection with another person. Vast advancements in printing technology have led to a wide array of modern design elements that catch attention. The feel, style, weight, and overall aesthetics of a business card can speak volumes on a company’s brand message without saying a word. 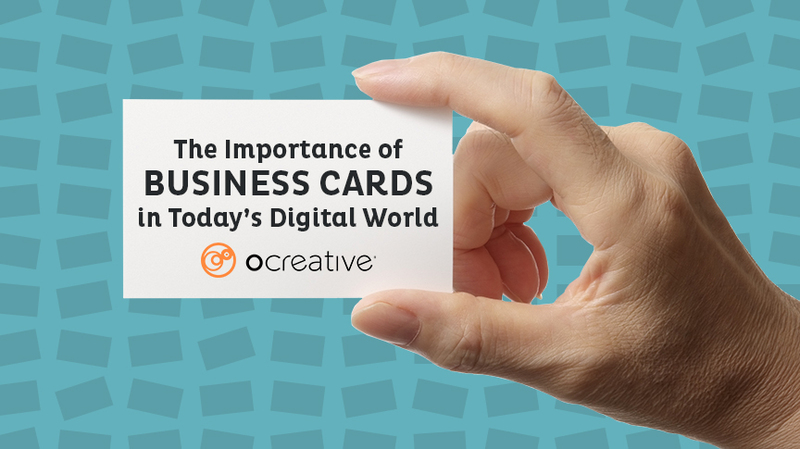 In this article, we explore why business cards still hold great importance even as the business world continues to evolve digitally. A business card is the first tangible impression of your business and remains a standard in business networking. The exchange of business cards is still powerful and more professional than exchanging information via smartphones. According to Kristopher Jones, CEO of LSEO.com, sending an email is not too informal, but business cards are far more professional to bring along to a face-to-face meeting. Emails can get lost in spam, forgotten, or unintentionally deleted. Business cards are concrete and tactile – they leave in the hands, purse, pocket, or wallet of a new contact. Business cards remain the quickest and most efficient way to exchange information and are acceptable in almost every business setting, eliminating the possibility of an unprofessional appearance. Gone are the days of the Rolodex – keeping business cards in a physical filing system can be messy and inefficient. Because of advancements in digital resources, it is more common to digitize the contact information provided on a business card. Contact management systems (CMS) make it easy to organize your contacts and attach notes regarding specific information for that contact including how you connected, key details regarding their work, and plans on how to follow up later. Marketing automation software creates an even easier way to store contacts, create email campaigns, and track data. Using these online tools will assist in creating a successful online follow-up, a requirement in today’s business environment. While exchanging business cards is not enough to stay connected, an email follow-up or a follow on social media has proven a modern requirement. According to Solomon Thimothy, CEO of OneIMS, “Today, you need to connect through LinkedIn, have your own website with an online portfolio, and of course, follow each other on social media” (Forbes). It is, arguably, a lot easier driving new connections to online resources when their first impression is a beautifully designed business card that tells an eloquent story without a long verbal narrative. Don’t forget the back: don’t leave the backside of your business card blank! Utilize this space to include more branding elements, a full-color logo, a slogan, or mark. Historically, some industries used the back of the card to write detailed notes, but advancements in digital sharing have rendered this process obsolete. Take advantage of this space to show who you are as a company and make a noteworthy statement. Tell your branding story: consistent branding ensures the same message is received each time a person comes in contact with your brand. A business card is your first encounter, so make it count. An eye-catching design or graphic is enough to drive the recipient to your online presence – make sure the message, tone, and style match and stand out. Paper weight is key: thicker paperweight emphasizes quality and confidence. A heavy cardstock can speak volumes about who you are as a person and the values of your business. Thinner paperweight often appears inferior and leaves an impression of low quality and thoughtlessness. While lighter paper weight may not always generate a negative opinion, it is more likely to be forgotten. Texture and embellishment: adding texture to your business card is a great way to add interest to the overall design and tactile experience of the card. Print techniques such as spot UV and embossing can add depth and interest, driving people to take notice once they feel the texture of the card. Coating: business cards can now be printed on papers with different finishes, such as matte, silk, deckle, or eggshell. Coatings can add to the weight and overall textural quality of the card. Business cards continually remain an important piece of business collateral, even as we evolve digitally. As a first impression, business cards are the first step in introducing your brand to a new contact. Business cards are tangible items that carry more weight than a quick email or contact share on a smartphone. Different design elements ensure your business card attracts attention and drives recipients to your online presence. 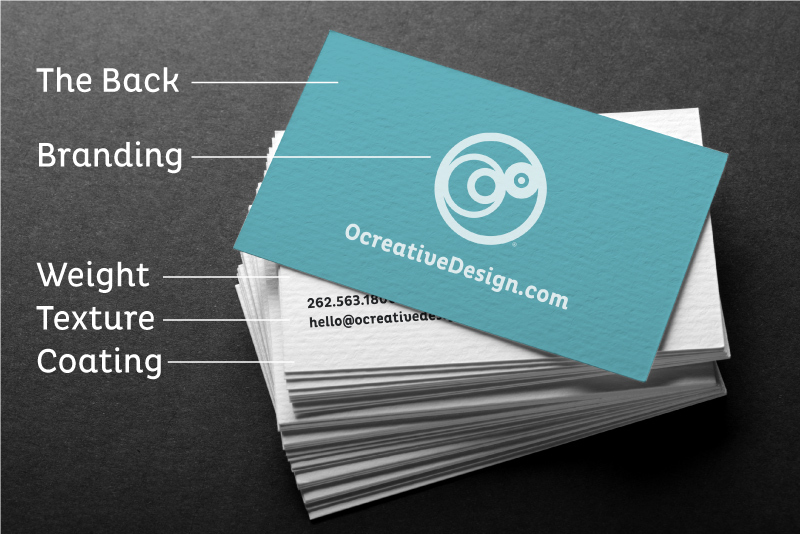 If you need help with business card design and development, contact Ocreative via email or phone. We continue to create standout, quality business cards for our clients that send a strong message in an unforgettable format.